Hypoxia occurs in a variety of critical illnesses and results in inadequate delivery of oxygen to the tissues. Hypoxia occurs secondary to low oxygen levels in the plasma (hypoxemic hypoxia), low hematocrit (anemic hypoxia), or hemoglobin dysfunction. Hypoxia can also result from the inability of cells to accept appropriately delivered oxygen (histotoxic hypoxia). Indications for oxygen therapy include a blood oxygen saturation (SaO2) of less than 92%, partial oxygen pressure (PaO2) of less than 70 mmHg on room air, cardiac instability, or hypoventilation. Oxygen supplementation is often thought of as a non-invasive, benign therapy; however, its use does carry the potential for adverse effects to the body. Appropriate flow rates are imperative for effective and safe oxygen delivery. Drying and dehydration of the nasal mucosa, respiratory epithelial degeneration, and impaired mucosal ciliary clearance increase the risk of infection in patients receiving supplemental oxygen. Humidification decreases the risk of mucosal damage exponentially. In healthy animals, hypercapnia is the primary stimulus for respiration. Because animals with chronic respiratory disease often live with elevated CO2 levels, they are largely dependent on hypoxemia to stimulate respiration. 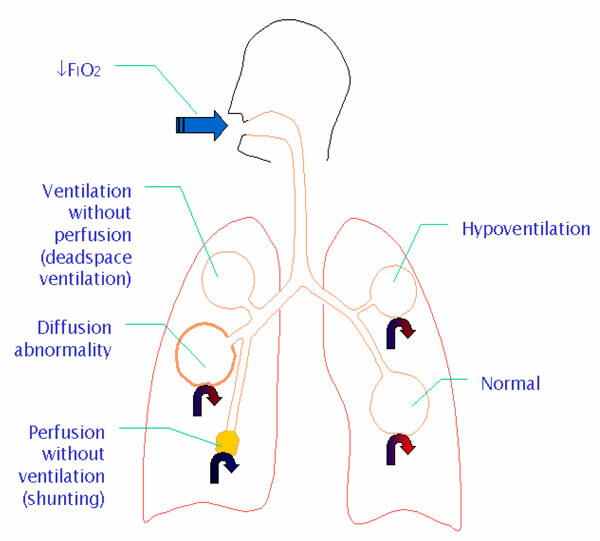 The administration of oxygen to a chronically hypercapnic patient will depress the hypoxic respiratory drive precipitously, and can lead to hypoventilation and eventual respiratory failure. Caution should be used when providing oxygen therapy to patients with chronic respiratory disease. Although a small amount of ROS are produced through cellular respiration, a large amount of free radicals are created after any ischemic insult. With an overwhelming increase in reactive ions, systemic anti-oxidant defenses rapidly become depleted. Oxygen-derived free radicals subsequently cause direct damage to epithelial cells, and result in cell death. Effects of membrane damage are seen in all organ systems, but are especially prominent in the brain, lungs, GI tract, and vascular endothelium. The CNS is especially sensitive to oxidative damage because of its high lipid content and low antioxidant levels. Excessive oxygen therapy can exacerbate primary brain injury and result in severe secondary damage, especially in cases of trauma. On a pulmonary level, oxidative destruction of the epithelial lung lining leads to airway inflammation, increased tissue permeability, pulmonary edema, and ultimately fibrosis. In the GI tract, ROS driven compromise predisposes to ulceration and bacterial translocation, increasing the risk of sepsis. Finally, vasoplegia can result secondary to capillary leak and microvascular sludging. This can lead to refractory hypotension in extreme cases. Ischemic conditions carry additional risk for the development of oxygen’s adverse effects, as their pathology involves an element of oxidative damage prior to oxygen therapy. 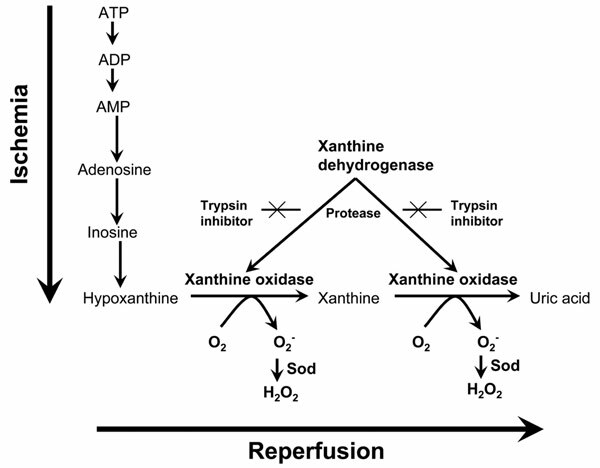 Patients suffering from traumatic brain injury, post arrest syndrome, compartment syndrome, or prolonged hypotension often have a buildup of reactive intermediates which only need additional oxygen to incite a cascade of oxidative injury. In these cases, supplemental oxygen should only be provided if there is evidence of hypoxia. The severity and time to develop oxidative injury are dependent on the fraction of oxygen provided (FiO2) and duration of therapy. As a general guideline, FiO2 of over 60% should not be administered for longer than 24-48 hours. Used judiciously, oxygen therapy is one of the most important tools available for critical patients, but it is not an innocuous therapy. It is imperative to be conscious of oxygen “as a drug” and use it accordingly. If you should have any questions, please feel free to eMail Dr. Nicole Spurlock or call her at (631) 587-0800.